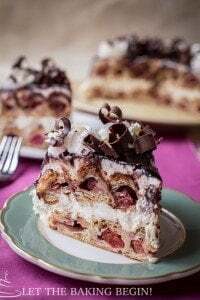 Cherry Chocolate Pavlova is a meringue dessert that’s made of crispy on the outside and soft and fluffy as a cloud inside meringue disk, which is then topped with whipped cream and cherry sauce. Got egg whites? Check out more MERINGUE RECIPES HERE. PIN this recipe to your Pinterest Boards. Cherries are finally in season and what better way to showcase the beauty of the plump little red jewels then to make this Cherry Chocolate Pavlova? Guess what else is almost here? Father’s Day! Bring this beautiful dessert, share it with your dad and wow his socks off this holiday! It is a meringue dessert that was named in honor of the ballerina Anna Pavlova who was visiting Australia or New Zealand in the 1920s. The cake is crispy on the outside and very soft and marshmallowy on the inside. Typically it is topped with whipped cream and fruit. Is Pavlova the same as Boccone Dolce? No, it is not. Many people use the two names interchangeably, but the texture of the meringue cake is what makes it different. Difference between Pavlova and Boccone Dolce is that Pavlova is soft on the inside, and Boccone Dolceis crispy all the way through. Pavlova has Australian roots, while Boccone Dolce has Italian. What Cherry Sauce Substitute can be used? You can use canned and drained cherries, fresh cherries tossed with some sugar and rum, canned cherry pie filling, or just chopped fruits or berries. This Cherry Chocolate Pavlova recipe is super simple and easy to make. When people see the beautiful meringue cake, no one believes me that it is as quick to make as it is! All you have to do is whip the egg whites and sugar, mix in the chocolate and cornstarch then bake! After the cake has been baked and is cooling, you make the cherry sauce and whip the cream. If you would rather not spend the time on making the cherry sauce you can use drained canned cherries, or even fresh pitted cherries would do! It’s all up to you and how much time you want to spend on this. The amazing thing is, you can make all three components (Pavlova Base, whipped cream, cherry sauce) of the cake ahead of time and do a quick 5-minute assembling session right before serving for best flavor. 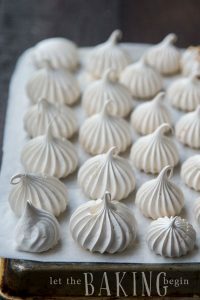 If you’re scared about working with meringue, read THIS post to learn about some do’s and don’ts when it comes to meringue desserts Let the Baking Begin! You can do this! Ingredients for Cherry Chocolate Pavlova. For best results make sure to use room temperature egg whites. Another important thing – ensure that there are no traces of grease on neither the mixing bowl or in the egg whites (from the egg yolks). This might prevent you from having optimal results. Also, use the best quality cocoa and chocolate you can find. There’s not a lot of them in this recipe, but you will taste the difference in quality. Start by whipping the egg whites and sugar in a bowl of a stand mixer for about good 15-20 minutes. Under-whipped meringue is the culprit to almost every batch of ruined meringue. So don’t try to rush the process. While the meringue is whipping, line a baking sheet pan with parchment paper . Place an 8 inch round plate or baking pan and trace around it with a marker. Turn the parchment paper over. Now, sift in the cornstarch, cream of tartar, cocoa powder and carefully fold everything in. Lastly, gently fold the chopped chocolate. Spread the prepared Chocolate Meringue mixture within the drawn circle on the parchment paper. The meringue expands as it bakes to around 10 inches. Place in the oven and immediately reduce heat to 225F. Bake for 1 hour, then turn off heat, open the oven door slightly and stick a wooden spoon in. Allow to cool in the oven for 30 minutes. Lastly, remove from the oven and allow to cool completely. While the Pavlova disk is baking and cooling, make the Cherry Sauce and allow it to cool completely. Add the chilled heavy whipped cream to a bowl of a stand mixer and whip for a couple of minutes on medium speed until soft peaks form. Do not over-whip or the cream will turn gritty or even separate. Transfer the Pavlova cake to a serving platter using this Cake Lifter, or just gently slide it onto the serving platter. Spoon the whipped cream on top and spread it around. Top with the prepared Cherry Sauce, 1 cup of canned and drained cherries, r 1.5 cups of canned Cherry Pie Filling. Serve right away. Mini Boccone Dolce – these are always a hit at parties! 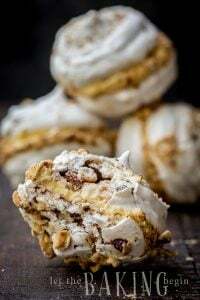 Hazelnut Meringue Bombs Recipe – people are usually blown away by these meringue bombs from the first bite. Chocolate Kiev Cake – Ukrainian classic, with a twist. All 5-star reviews on this one. 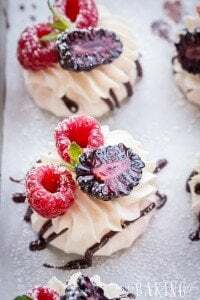 Chocolate Cherry Pavlova is a meringue dessert that's made of crispy on the outside and soft and fluffy as a cloud inside meringue disk, which is then topped with whipped cream and cherry sauce. Combine egg whites and sugar in a bowl of a mixer and whip on high speed of a stand mixer for about 15 minutes (will take longer if using a hand-held mixer). Turn oven to 350F with the baking rack in the middle. Now, sift the cornstarch and cream of tartar into the egg whites and carefully fold them in. Next, sift the cocoa powder and fold again. Lastly, add the chopped chocolate pieces (or chocolate chips) and fold. Spread the chocolate meringue within the drawn circle. Reduce heat to 225F and bake for 1 hour, then turn the heat off, stick a wooden spoon between the oven and the door and allow to cool for 30 minutes. Next, remove from the oven and allow to cool completely. While the Pavlova Meringue disk is cooling follow the instructions HERE and make the Cherry Sauce. While the Pavlova base is cooling make the Whipped Cream. Add the heavy cream to a bowl of a mixer and whip on medium until medium peaks form, about 3-4 minutes. Do not overwhip the cream or it will look curdled and separate. Transfer the Chocolate Pavlova to a serving dish using a cake transferring spatula or just slide it off the parchment paper onto the serving platter. 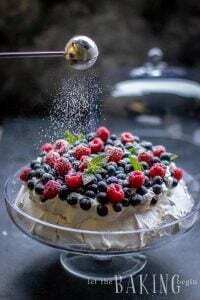 Top the pavlova with whipped cream. Then, layer the cherry sauce on top. To make ahead, bake the pavlova meringue disk up to a day ahead. Store in a dry place or leave in the oven until ready to use. Prepare the whipped cream and refrigerate. Right before serving, spoon the whipped cream, top with cherry sauce and serve. If you do not have cream of tartar, you can replace it with vinegar. Just add 1 tsp of vinegar into the egg whites as they're whipping, instead of folding them in after the egg whites are whipped.